The sense of deflation has eased and the Hearts players are now ready to get back on the horse. Last weekend’s 3-2 defeat at home to Falkirk jarred with Jambos everywhere as they’d forgotten what it felt like to lose a league game, something they hadn’t previously done since May 7, 2014 when Partick Thistle won 4-2 at Tynecastle in Hearts’ penultimate game as a Premiership team last season. Although dreams of an unbeaten surge through an entire Championship campaign have now been dashed, Hearts’ focus on winning the title remains as strong as ever. “There was always a part of you that hoped we could go through the whole season unbeaten, but, in our heads, that was never the first thought,” said Callum Paterson, the Hearts right-back. 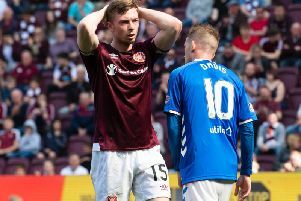 The main disappointment for Paterson was that Hearts – swashbuckling and gutsy for most of the season so far – surrendered their unbeaten record in relatively meek fashion. “The manner of the defeat was worse than actually losing our unbeaten record,” he said. “If we’d played well and lost, it wouldn’t have felt as bad, but it’s disappointing that we didn’t play well. It was very frustrating. It was a poor performance from everybody, myself included, and it showed in the result. After earning his maiden call-up to the Scotland squad for the November double-header against Republic of Ireland and England, Paterson’s next opportunity to be involved with the national team comes in March when Gordon Strachan’s side host Northern Ireland in a friendly and then Gibraltar in a Euro 2016 qualifier. However, the 20-year-old is adamant that his full focus is on taking Hearts back to the Premiership.